“At the end of the day, just because it’s out there and it’s not yours, that doesn’t mean you’re supposed to take it,” police Superintendent Eddie Johnson said at a news conference on Thursday. The truck was used as part of a joint surveillance operation with Norfolk Southern railways that was reportedly nicknamed Operation Trailer Trap. A number of arrests were made following the operation, the company said. But community groups say the truck was parked in low income, predominantly black, areas of the city and risked worsening the relationship between residents and the police. 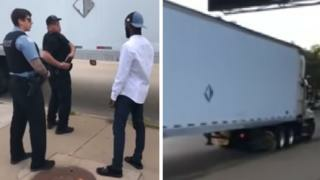 “Police in Chicago must focus on building trust and better relationships within the communities they serve, not engage in stunts like bait trucks,” Karen Sheley of the American Civil Liberties Union (ACLU) said in a statement. Others said the truck was a waste of police resources. Roderick Sawyer, who chairs the city council’s black caucus, slammed the operation as an attempt to “create crime”. “This initiative serves only to undermine already fragile efforts to build trust between law enforcement and the community,” he said. It is not uncommon for police to use vehicles and packages to lure potential thieves. The most common example is police “bait” cars, which are typically parked in areas where vehicle crime is a problem. The specially-equipped cars are sometimes left with mobile phones, sat navs, laptops and other valuables on display. They are usually equipped with GPS tracking devices so the police can find the stolen goods and apprehend the thief. Earlier this year, police in San Francisco deployed “bait bikes” following a surge in thefts in the city. In 2012, police in the UK filled a lorry with fake goods and used it as bait to target gangs.